First published in 1928, the Aslib Directory is the leading information sources reference work on organizations of all kinds. Now published in its 14th edition, the title's diversity is reflected by the wide spectrum of entries. The Directory is widely regarded as the best publication of its type. 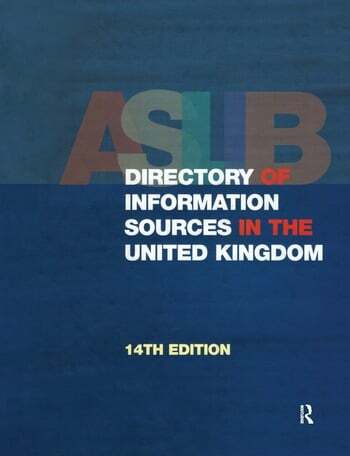 The Aslib Directory of Information Sources in the United Kingdom provides instant access to listings of over 11,000 associations, clubs, societies, companies, educational establishments, institutes, commissions, government bodies, and other organizations which provide information freely or on a fee-paying basis. Each entry is listed alphabetically and includes the organization's name and contact details, type and purpose, and lists publications and collections where appropriate. The Directory also contains a comprehensive index of acronyms and abbreviations and a substantial cross-referenced subject index.